Called the "silent killer," hypertension rarely produces overt symptoms and can be deadly if left uncontrolled. A study published in a 2003 issue of the Journal of the American Medical Association reports that two-thirds of hypertensive individuals in a large-scale national health study had hypertension that was either untreated or undertreated. Below are symptoms that may emerge when blood pressure reaches very high levels. If you are experiencing any of these symptoms, contact a health care professional right away. Hypertension increases the risk of heart disease, heart attack, stroke and renal disease. When not controlled blood pressure levels can rise to the point that you start to experience physical symptoms. Some of the symptoms are nonspecific and may be overlooked as being a byproduct of some less serious condition or external cause. These include headache, fatigue, anxiety, confusion or forgetfulness, excessive perspiration or dizziness. These symptoms can worsen acutely and in some cases result in sudden death. You should seek immediate assistance from a health care professional if you're experiencing muscle tremors or a sudden fall, trouble speaking or understanding speech, blurred or loss of vision, severe nosebleeds, coughing up blood, chest pains, numbness or tingling in your hands and feet, weakness or numbness of your face or one side of the body or a severe headache from an unknown cause. If you're already diagnosed with hypertension and experience new symptoms upon starting a new blood pressure medication you should consult your physician right away. 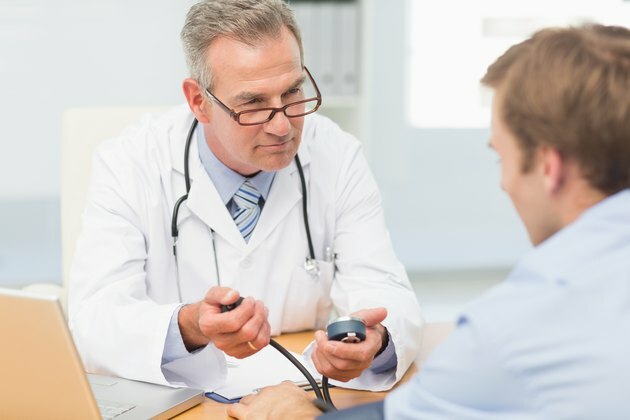 A May 2009 issue of Diabetes Care published the results of a study which concluded that uncontrolled hypertension is associated with a twofold risk of developing diabetes in nondiabetic hypertensives. Individuals with both diabetes and hypertension have even higher rates of developing cardiovascular disease, kidney disease and cerebrovascular disease (stroke). Hypertensive diabetics are also at risk of developing blindness if their hypertension is left uncontrolled. Secondary hypertension is caused by another underlying medical condition related to the endocrine system, heart, arteries or kidneys. This sets it apart from regular hypertension (sometimes called essential hypertension), which is caused by diet, lifestyle and hereditary factors. Secondary hypertension may be unresponsive to traditional antihypertensive medications because they do not address the real underlying cause. Symptoms of uncontrolled secondary hypertension include having a systolic blood pressure over 180 or a diastolic blood pressure of over 110. Other symptoms include having high blood pressure without any family history of the condition, suddenly developing hypertension before age 20 or after age 50 or having hypertension that is resistant to common high blood pressure medications. What Are the Symptoms of High Blood Pressure Headaches?